The Mermaid's Tale: Parallel pillars point to "Paranthropus"
Are you lying awake at night wondering whether or not you should call robust australopiths "Australopithecus" or "Paranthropus"? This is just what you need to help you fall asleep quickly. It's a recent article in PNAS called, "CT-based study of internal structure of the anterior pillar in extinct hominins and its implications for the phylogeny of robust Australopithecus." The researchers looked at the inside of traits (the anterior pillars on either side of the nose) that look similar on the outside in two South African species (A. africanus and its neighbor robustus) and determined that they're different. They conclude that they're different because they develop differently due to genetic differences and so they are not the same structure in the two homs. Without that link to africanus anymore, robustus does not need to be reconstructed as part of a South African lineage of Australopithecus. Instead, it can be appreciated for all its obvious, massively toothy similarities to another well-known robust species, boisei from East Africa. Before this study, based heavily on the anterior pillar link, it looked like robustus and boisei may have evolved in parallel or convergently from local africanus (South) and afarensis (East) respectively. This is why they were kept in Australopithecus but were always labeled as "robust australopiths." This study indicates that they did not evolve in parallel and supports the lumping of all robusts into one genus with a single (monophyletic) origin: Paranthropus. But to even more strongly support that robustus and boisei evolved from a common ancestor--to support one genus for the "robust australopiths"--they needed to look at the internal structure of that same region of the face in some boiseis and girlseis and show us that the similarities there with robustus beat out the differences between africanus and robustus. And they did that...how satisfying! And guess what they found? The boiseis look like the robustuses on the inside even though the outside is different. In fact, I have lain awake wondering about this. Not kidding! You're braver than I to admit this. Instead I ridiculed hypothetical others to deflect the pain. Well, I am in charge of several publications that use the term Australopithecus. We need to decide whether to switch to Paranthropus. Once we switch it will be hard to reverse. If you want to take a cue from the Smithsonian, they've adopted Paranthropus too. Hmm, we are debating if robust australopithecines should be classified as a monophyletic genus called Paranthropus. 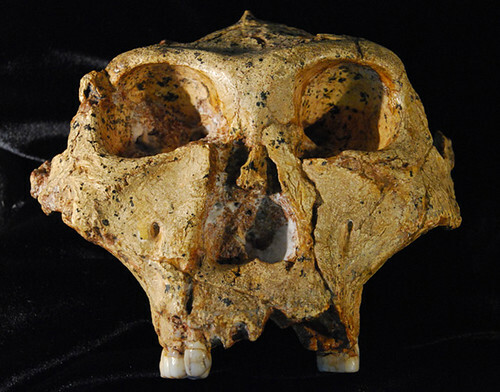 Assuming robust australopithecines are a clade (monophyletic group), then we could have the monophyletic genus called Paranthropus and what is the highly likely polyphyletic genus called Australopithecus. I see no consistency with this. If we want consistency with cladistics, then we need to avoid assigning more than one extinct species per genus. For example, we can never be sure about definite ancestral relations in the fossil record. If we insist on being consistent with the cladistics of australopithecines, then we can have only one Australopithecus species. And if we make more than one Paranthropus species, then more discoveries could cause other problems of polyphyly. So you're saying that genera can only be dead-ends? And if it's ancestral to something, then it can't be a separate genus than that thing? Because life is an unbroken thread (thank you Carl Sagan) so by that logic, all taxa should have the same genus. Q2. Yes, if we are insisting upon monophyly, which has something to do with the discussion of using the classification Paranthropus.